Speed-up of MATLAB: Just-in-time compiler JIT – Computer Aided Finance - Excel, Matlab, Theta Suite etc. Sometimes, MATLAB seems to be slow and inefficient. MATLAB is great for prototyping and interactive analysis, but sometimes execution speed is crucial. The MathWorks proposes to vectorized your code. Recently, I found that this is not always the best solution for higher speed. A better solution comes from the sparsely documented JIT Compiler which was already introduced in 2002.
data of type double or char. The JIT compiler is under development and theses restrictions might not hold for all MATLAB versions. A description for MATLAB 6.5 JIT is here. Running this code leads to “Elapsed time is 0.000015 seconds.” for the first run and to “Elapsed time is 0.000013 seconds.” for the second run. That means Jit is about 6x faster than the vectorized version. Now, we want to find out, when this speed-up occurs. 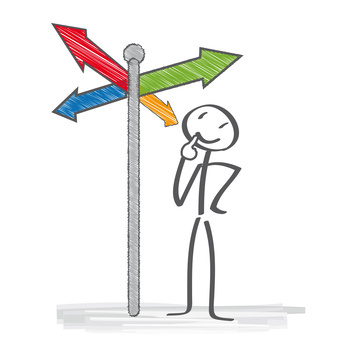 We create a function such that we can easily create multiple runs. Benchmarking MATLAB JIT against vectorized version and bsxfun(). For small problem sizes (n<100), JIT (red) is about 10x faster than the other code variants. For large probelm sizes (n>10.000), the vectorized version (blue) is about 10x faster than JIT. In this plot we can see that for small problem sizes (n<100), JIT (red) is about 10x faster than the other code variants. 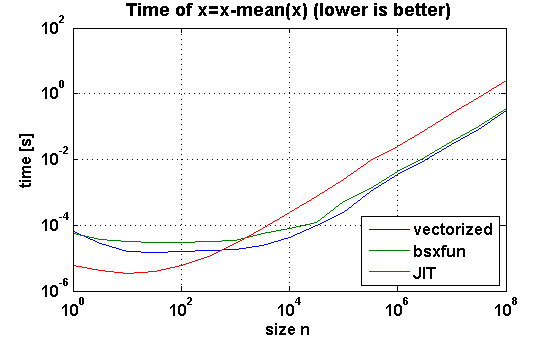 For large problem sizes (n>10.000), the vectorized version (blue) is about 10x faster than JIT. That means the speed-up is highly dependent on your specific problem. In my experience, JIT is great for small loops which are called often. Usage of the Just-in-time compiler (JIT) of MATLAB is easy. Just forget about the vectorization. The speed-ups can be significant. In a real-life implementation, I saw a speed-up of over 600x. It is worth trying if speed is key for you. Otherwise, you might want to stay with a readable vectorized code. Very nice article. I can confirm the numbers with problem size n=100, though my machine is a bit slower than yours and takes longer to execute in all cases. So vectorizing code pays out only when the problem size is sufficiently large. I’ve determined the break even to be on my system n=9000 (JIT vs. bsxfun). That’s much more than I thought. Thanks a great new insight!